When life gives you lemon and lime...make yourself some tea! Refreshing aroma of lemon and lime will warm you in the winter, and cool you in the summer. 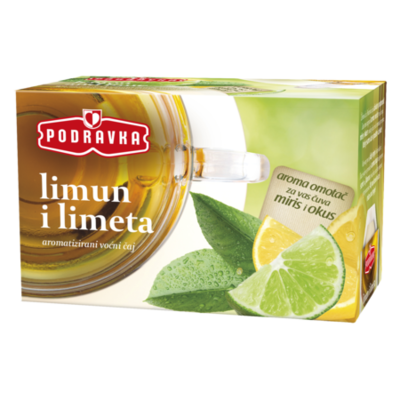 Podravka tea provides carefully selected apple and rose hip fruit, while additional touch of lemon and lime aroma gives the tea its characteristic sweet and sour taste. This tea is appropriate for any occasion, it is an excellent hot or cold drink to replace the loss of essential fluids in organism, along with water or common non-alcoholic drinks. Each filter bag is packed in an aroma envelope, a special foil that preserves the freshness and aroma. Pour the filter bag with 200 ml of boiling water and cover. Remove the filter bag after 8 minutes. Sweeten to taste. Cooled tea or tea with ice can be served as a refreshing drink. Packaging: 20 filter bags per2,5 g / net 50 g.